Hi dude, I don't know how to post a new image in your blog, so I'm sending this e-mail, I hope you can help me with this. I really need to know what is the meaning of this tattoo. 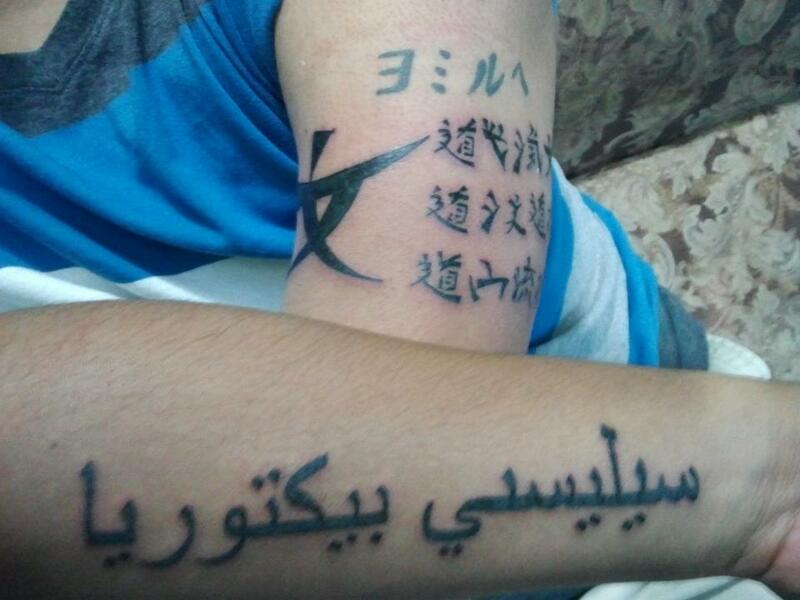 Whoever got this tattoo is an idiot, and this is why. The Arabic says something along the lines of "Selassie Victoria" (from right to left, of course). Yeah, it's difficult to identify the first word in particular because the artist has left the letter between the س and the ي without any dots. It could be a ب ت ث ن (n, th, t, b) for all we know...I think it's supposed to be سيليستي "Celeste". The 2nd word is spelled OK, though I'd personally spell it فيكتوريا. Arabic sadly doesn't have a letter corresponding to the letter "V" in English, so you can either use ب "B" or ف "F" as a substitute.